This item works! 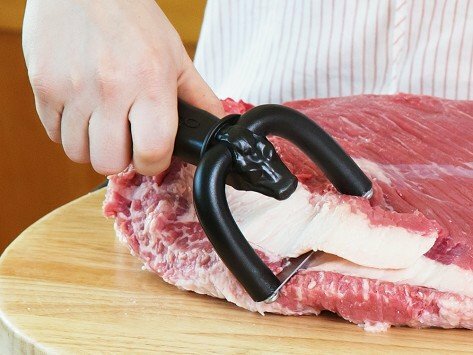 I made barbecue brisket for Christmas Day dinner and this helped me trim up the brisket much quicker than the knife method. I don't cook brisket very often since there are only two of us but when I do, this will make prep go so much better. That is worth it's weight in gold ! It really trims the silver skin on deer meat without taking big slices of meat with it. The only thing I would have to say is to watch the blade and use with care ... it is sharp beyond belief ! This is a fantastic product. Works just as described . Makes fast work of trimming fat caps. Highly recommended. I used this for the first time today to trim a brisket. Even grassfed beef has fat - and this tool made it easy to remove a good half pound of fat. Super easy to use with very little waste. Love it! I am giving this a 5 but I am not having much luck with it. it is really a very sharp tool. I wanted it mainly for removing silverskin from pork tenderloins. I believe maybe the meat should be about half frozen to work right. I have taken too much meat off with the silver skin and sometimes I cant get it to get under the silver skin. if anyone has suggestions for me that would help me use it better I would appreciate the help. Most Excellent! I love this. Glad I own my Quick Trim! I do a lot of Tri-Tip and bacon. The hardest part to the prep is removing the excess fat. It is especially hard on pork belly. Leaving the just right amount of fat is a task. This tool is worth every penny in my book! Bought this for my husband, who does competition BBQ and he loves it. It saves so much time - we actually purchased a 2nd one for one of his team mates. Bought for gifts. Will have to wait until after Christmas. But sure son and son-in law will enjoy. Thank you. I bought two trimmers & will buying another in the future!